Heart attack and strokes are more likely to kill firefighters than an actual fire. A recent research article just confirmed one of the major reasons why. The research confirms that the physical demands of firefighting may trigger the formation of blood clots and impair blood vessel function — two factors associated with increased risk of heart attack and stroke. (You can read more about that research by clicking here.) The research also confirms the importance of proper fitness and hydration in firefighters. Take a look at the article below and make sure you (and your crew) stays hydrated. It can save your life! In most stations, your shift starts with checking your gear, SCBA, med supplies and looking over the apparatus (usually with a cup of coffee in hand), but do you ask yourself, Am I physically ready to do my job? I imagine 100% of you nodded your head in affirmation to that seemingly rhetorical question. The human body is 66–70% water. Under normal circumstances, the human body loses about 35–90 oz. of water a day through body waste, sweat and breathing (Maughan, 2003). During normal athletic activity, the body can lose 8–16 oz. of water per hour. The extreme conditions of firefighting demand more than this. On average, working firefighters should anticipate losing 50–70 oz. of sweat in 30–45 minutes of fireground activity (Levine et al., 1990). For a 200-lb. 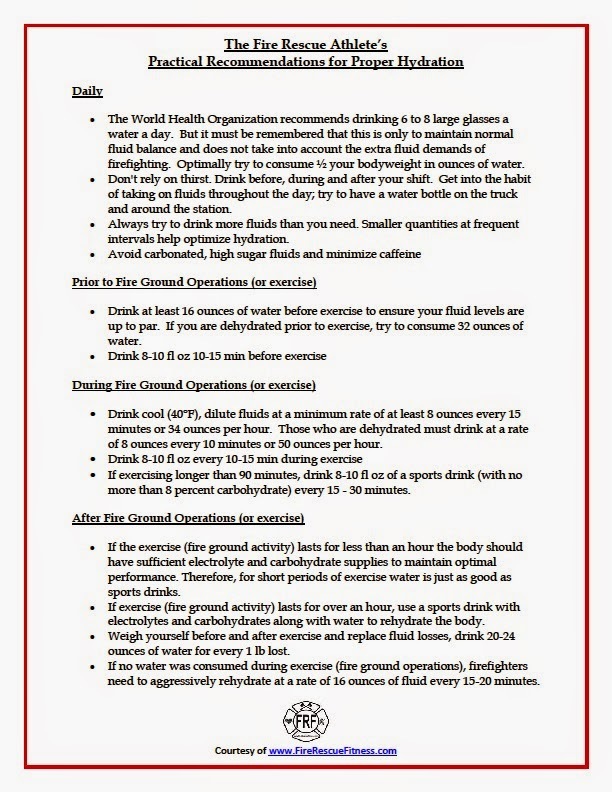 firefighter, a 2% sweat-induced loss of body weight would require a post-exercise fluid intake of about 96 oz. or more, considering the individual was well hydrated before the call. Hydration is critical for optimal performance. Progressive dehydration from exercise (or fireground operations) impairs performance, mental capacity and perception of effort, and it can be life-threatening. With as little as a 2% shortage of body water, the ability to perform a high-intensity activity can be greatly impaired (Kleiner, 1999). The combination of the hot environment and the protective gear insulating the firefighter can produce dangerous conditions of hyperthermia and dehydration. Properly hydrated, well-conditioned firefighters are therefore much better able to contend with heat stress than their unconditioned and/or dehydrated counterparts. Put that into the context of your crew, which is only as strong as its weakest member. If you don’t hydrate yourself properly before arriving on the fireground, you’re not only putting your own life in danger, but the lives of your crewmembers as well, because your performance level could be greatly reduced (IAFF, 2006). For these reasons, dehydration must be addressed before the firefight begins. To stop dehydration before it starts prior to the alarm for a service call, you must limit the use of stimulants, such as caffeine, avoid carbonated beverages, maintain physical fitness and stay adequately hydrated throughout a shift. Drink plenty of water at regular intervals, and aim to replace fluids at the same rate that they’re lost. At minimum, consume 64 oz. of water a day (Casa et al., 2000). Increase that amount when exercising on duty and after you’ve completed your workout to avoid being dehydrated at the scene. I cannot stress the importance of hydration enough. Hopefully this article convinces you to grab some water and encourage others to do the same. Lets take care of each other and our fitness. Please share this, like it and comment.